Community members in Far Rockaway gather for one of the early meetings about cooperatives. (WNV/Peter Rugh)Three and a half months ago, the walls upstairs at the Church of the Prophecy in Far Rockaway, a low-income coastal neighborhood of New York City, were covered with maps of where help was most needed. The church was a hub for the Occupy Sandy relief effort after Hurricane Sandy. Now, nearly five months after the hurricane struck, the maps have been replaced by posters extolling the virtues of collective struggle and art made by neighborhood children enrolled in Occupy Sandy’s twice-weekly after-school program. 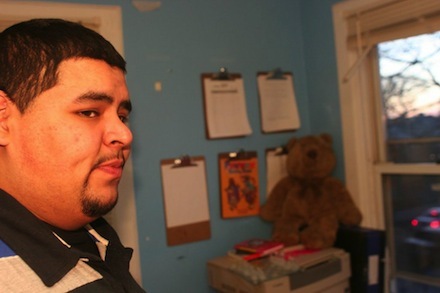 “The kids missed a month and a half of school,” explained Luis Casco, a member of the church’s congregation who pulled strings to help move Occupy into Far Rockaway. The after-school program was, in part, his brainchild. “We figured we’d start helping the kids and we could win over their parents. Then we could actually start bigger projects,” he said. 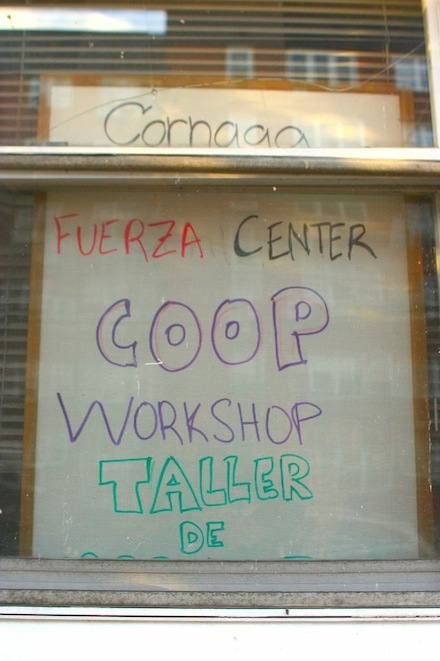 One of those bigger projects is a worker-run cooperative initiative, organized by Occupy Sandy and supported by the Working World, an organization that specializes in incubating collectively owned businesses. The initiative is well suited to Far Rockaway because worker-run enterprises have a history of flourishing in environments of economic distress or political upheaval. In 2001, when Argentina defaulted on its international loans and the country’s ownership class fled, Argentines took over abandoned factories and established networks of producers and distributors. In Venezuela, worker-run cooperatives were at the heart of the vision for 21st-century socialism, and Hugo Chavez’s administration helped create tens of thousands of collectively owned businesses over the last 14 years. Most notably, Spanish workers in the Basque region created the Mondragon Corporation, the world’s largest federation of cooperatives, during the Franco dictatorship in the 1950s. Today more than 250 enterprises operate under the Mondragon banner, and the federation, which spans 77 countries and employs 83,000 workers, has been widely praised. “Collective approach pays big dividends,” read a headline about Mondragon in The Financial Times last year, while the New York Times noted the “use of workers’ share capital and loans” has enabled the federation to remain stable through vacillations in global markets, including the ongoing financial crisis. While Mondragon shows what is possible down the line, Far Rockaway residents are at the very beginning of the process. At one of the crowded early meetings of the cooperative initiative, children and adults buzzed about, fraternizing with disposable plates of food in their hands as extra folding chairs were arranged. Several parents whose children attended the after-school program arrived, bringing their friends and neighbors along. Most were Spanish-speaking immigrants who, having spent their lives working for someone else, were eager to learn more about cooperatives. Many in Far Rockaway lost their jobs when Hurricane Sandy rendered commutes impossible for flooded local businesses. For those without U.S. work papers, finding new employment has been difficult. Others, such as Olga Lezama, managed to keep their jobs after the storm, but the prospect of holding on to the profits of their labor has piqued their interest. Lezama currently works as an upholsterer for a high-end furniture company. By Lezama’s calculations, her boss makes approximately $500 every hour off the furniture that she and her co-workers upholster, while she earns roughly $100 a day. By her side was her husband, Carlos Lezama, a carpenter who specialized in cabinets. The pair hope to work with others in the community to form a home-design cooperative, a service in high demand after the storm, which ruined the ground floors of most of the region’s low-lying bungalows. Occupy Sandy has allocated $60,000 of the $900,000 it raised in the initial flood of generosity following the storm toward forming cooperatives, an initiative they hope to spread across storm-affected areas if it proves successful in Far Rockaway. The Working World, an organization that provides zero-debt micro-finance loans to new cooperatives, has offered to provide monetary support, but for now the organization is mostly lending advice and training. At one of the early meetings, Brandon Martin, The Working World’s founder, showed the crowd a slideshow of other projects the organization has helped launch. Images of a beekeepers’ cooperative in the countryside of Nicaragua and a shoe factory in Buenos Aires glowed on the wall behind Martin as he outlined the benefits of workers sharing resources and making decisions democratically. The Working World finances itself by collecting a small percentage of the profits that member collectives generate, money that the organization reinvests in establishing new enterprises. Martin explained that the idea originated in ancient Sumeria where the word for interest was the same as the word for calf. But if the cow was sterile, the Sumerians didn’t collect interest. The same works for Working World’s loans today. The organization only collects once a cooperative generates a steady profit, a model that avoids forcing people into debt if their business fails. The Sumerians, for their part, eventually altered their lending practices such that they collected interest regardless of the outcome. The legacy of that shift is still with us today; few in Far Rockaway can call their surroundings their own. Walk through the neighborhood in the middle of a business day and you’ll see iron grating pulled down over storefronts and plywood covering the windows of large shopping complexes. Those stores that are open often bear the insignias of chain outlets that carry money out of the neighborhood and into the coffers of large corporations. Worker-run cooperatives, in contrast, could offer a way for community members to sell the products of their labor without selling their labor itself — a shift that would keep capital within the community and cash in the pockets of workers. At the following cooperative meeting a week later, the crowd had grown. 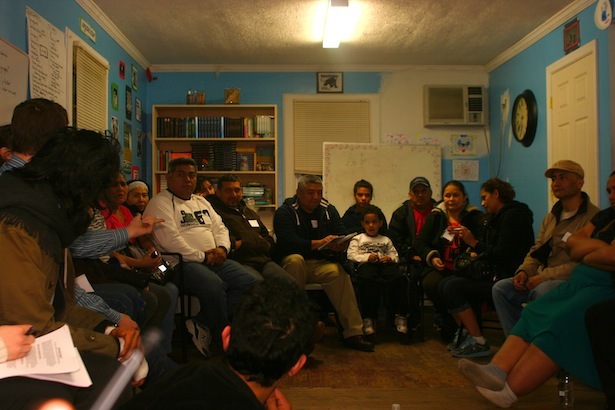 People discussed plans for a scrap metal business and a cleaning-workers’ collective. One man pulled a citizens’ band radio out of his winter coat, explaining that drivers in the taxi cooperative he hoped to form could use it to communicate. He’d been doing research; nine other drivers were needed to secure an operating license from the city. There is obvious enthusiasm in the neighborhood for worker-run enterprises. But are there limits to what these businesses can achieve while embedded in a broader economic framework of competition and exploitation? And does the focus on cooperatives represent a shift in direction for Occupy, one that veers away from a direct fight for systemic transformation? Richard Wolff, professor of economics at the New School and author of Democracy at Work, a study of cooperative businesses, argues that forming cooperatives can be the first step in enacting a sweeping social and economic shift. Wolff envisions a transformation, similar to the social shift from feudalism to capitalism, in which cooperatives replace corporations and goods are distributed through a democratically planned economy. The cooperatives that Wolff talks about, and the ones that Occupy Sandy is aiming to establish, are more accurately known as worker self-directed enterprises: businesses that organize democratically collective ownership at the point of production. “When the workers get together and decide how to distribute the income in such an enterprise, would they give the CEO $25 million in stock bonuses while everybody else can barely get by?” Wolff asks rhetorically. He stresses the difference between the productive and distributive side of economies, explaining that worker-run cooperatives are the often-overlooked prerequisite for achieving an egalitarian distribution of wealth and resources. “There is the question of what exactly an alternative to capitalism is,” he explains. “I’ve stressed worker-self-directed enterprises as a different way of organizing production.” On the other hand are markets, which distribute the fruits of production. Wolff believes that the mistake of many 20th-century socialists was to imagine that the elimination of markets would create social egalitarianism, even though production had not yet been reorganized into a democratic model. Given the pull between the productive and distributive side of economies, cooperatives must form networks to survive. Collaboration between networked enterprises allows these businesses to curb market pressures and, if the network manages to spread, to gain political power. Olga Lazema, however, isn’t thinking about the theoretical potential for cooperatives to challenge capitalism. She’s imagining the positive possibilities for her own neighborhood.